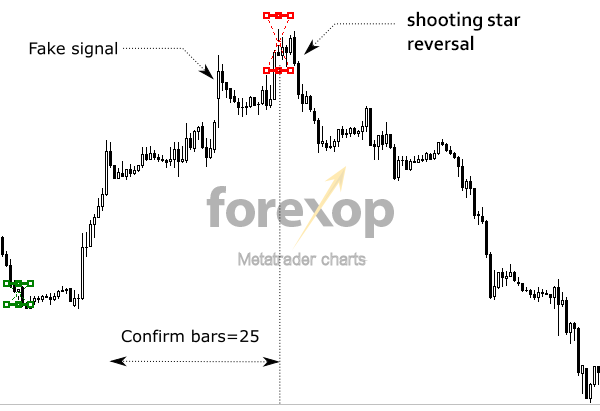 The following release notes are for the Metatrader MT4 Hammer, Doji Candlestick Detector. Drag and drop the indicator onto the required chart. The default settings are only a guide. You will need to tune these to your market and timeframe. The detections are marked on the chart in red/green for manual trading, however you can adjust these colors as required. The indicator outputs numerical values (see below) and these are displayed in the chart’s lower window. For lower timeframe charts (M1-M30) use a smaller point setting for the “shadow threshold”. This can be increased for longer timeframes. The indicator has both graphical and numerical output. The numerical output lets you use the system as an input to an expert advisor or other signalling software. 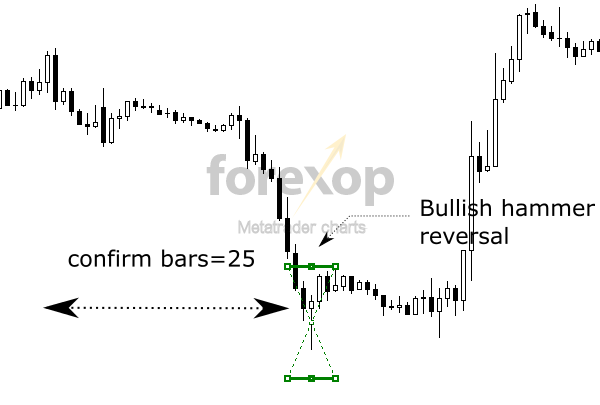 The indicator produces a numerical output at each pattern, with positive indicating bearish reversals and minus values indicting bullish reversals. The absolute value is a measure of the strength (or confidence). These settings will control the types of patterns that are detected and displayed on the chart and those which are ignored. Confirm bars: The indicator will examine a certain number of bars preceding the candle. This is defined in the “confirm bars” parameter. This is necessary to filter out weak and false signals and to analyze the direction of the trend. A lower setting will result in more signals but there will likely be more false positives. A higher setting will produce fewer but more viable signals. As shown in Figure 2 several weak hammers (doji), which were in fact fake signals, are filtered out. Figure 3 shows an example of a bearish reversal pattern using the same settings. A fake hammer signal is marked on the chart, and this is correctly filtered out. The accumulator is a type of oscillator. This signal can be used as an alternative measure of momentum similar to MACD, RSI or OSMA. The difference though is that it works the appearance of candle patterns. It can indicate an overbought/oversold market. Each bearish signal increments the line by 1. Each bullish signal decrements the line by 1. The signal rises when there are a series of bearish patterns which usually happens in an up trend. The signal falls when there are a series of bullish patterns which are usually seen in a down trend. The figures below show examples of how this works. The counting is over the number of bars set in the parameters (Accumulator width). 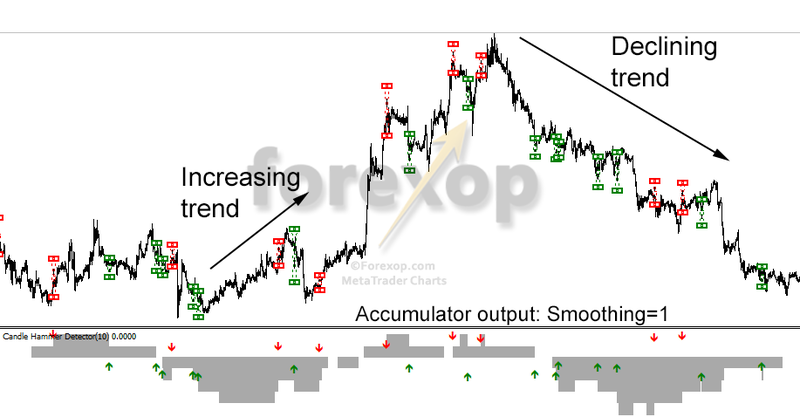 The output can also be smoothed as required from the setting Accumulator smoothing period (bars). This signal will lag depending on how much smoothing is applied and how wide the counting window is. The idea behind this is that the market is reaching “overbought” when you have a series of bearish (reversal) patterns without a correction. These usually occur in an upward trend. The accumulator line will increase in this situation because each bearish flag adds to the signal. In a down trend the reverse happens. Each bullish pattern decreases the signal. So a series of bullish flags without a correction will push the accumulator line downwards indicating that the market is reaching an oversold state. High values indicate a dominance of bearish reversals. Low values indicate a dominance of bullish reversals. The counting for the accumulator occurs over a fixed time period (in bars). This should be set according to the required scale. A wider scale will give a broader, but more complete view. A narrower scale will give a more precise but noisy view. When trading on Japanese candlestick signals the accumulator can be useful. It gives an idea of trend strength and the likelihood that a pattern will actually result in a reversal or be a fake signal. Extreme values in the accumulator suggest that more of the signals have been fake and have not preceded a reversal on the scale being examined. It also suggest that the market is reaching a more extreme position in being either overbought or oversold. For an example see the figures above. If you see no output from the indicator it could be due to the point size parameter. One of the inputs is the “Shadow threshold (in points)”. Since brokers use different definitions for point sizes you will need to change this as required. This default value is 150 points (15 pips) and this will work for most accounts. If your broker uses a larger point size (e.g. some micro accounts) then change this value to 15 points. A smaller value may be needed for lower time frames. The detection tolerance (in points) : Patterns which don’t break lows/highs are rejected when this is set to zero. Increase this value to accept cases that are close to but not above the threshold. This is a cut off threshold for the total size of the candle. It is the total length (H – L) for the candle. When this condition is true the pattern is displayed otherwise it is ignored. This number is in points.